"A Place to Grow" is the slogan developed by Iowa as part of a state, local and national marketing campaign launched in 1970 by Gov. Robert Ray to create jobs and business. The slogan along with a cloverleaf symbol was intended to represent economic opportunity for Iowa and individual growth in education, spiritual awareness, friends, and family. 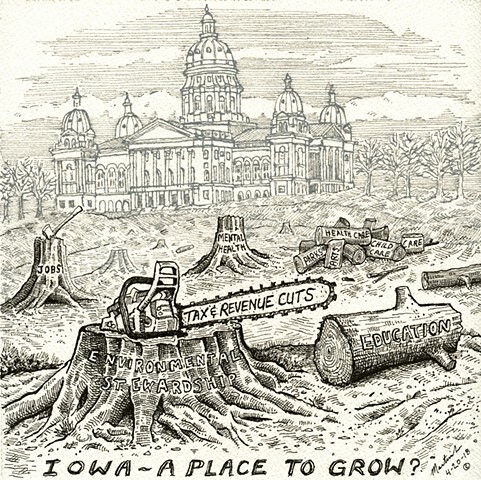 In recent years the Republican legislature's obsession with tax cuts has slashed state revenues. Many areas vital to public life are taking the brunt of the cuts in an attempt to balance the starved budgets, including a significant attack on higher education (that feels like part of a larger ideological attack). A short term focus on the firewood right now will lead us to a future without any forests.